A light weight kayak or canoe is an undeniable pleasure. Being able to easily lift your boat off the car or rack and walk it down to the water is a joy, and not facing hauling a 60 lb boat at the end of the day is doubly so. And what's more, knowing you can easily move your boat makes it far more likely you will actually get out and use it. Every week we get get people in the shop who tell us how they love to kayak, but just never do it anymore because they can't face hauling their boat to and from the water. But the solution is not to give up on paddling! The solution is a lighter boat, and nobody stocks a wider range of light weight boats than we do. Lincoln Canoe and Kayak are the kings of lightweight, producing boats that are almost unmatched in weight, and are also works of art. Built just up the road in Amesbury, Lincoln brings traditional craftsmanship to modern materials like aramid (Kevlar) and carbon fiber. Lincoln's Little Diamond and Big Diamond are some of the only recreational kayaks built in these light weight materials, offering the casual paddler a lovely, quality boat at as little as 30 lbs. Their transitional boats in the 12-15' range are a dream to paddle, and the range extends to trip-ready sea kayaks. The Lincoln canoe range goes from a 12' solo and a 12' tandem to expedition 17's, all still with hand-made quality. Hurricane works with thermoformed polyethylene to produce economical, fun kayaks. The heart of the line are the recreational Santees, 11.5' - 12.5', easy-paddling, nimble kayaks. They also produce the Skimmers, solo or tandem sit-on-tops that defy the heavy weight stereotype of SOTs and offer great performance, and include a pedal-powered version. The Hurricane Soujourns are a range of able transitionals in lengths from 12.5' to 14.5'. 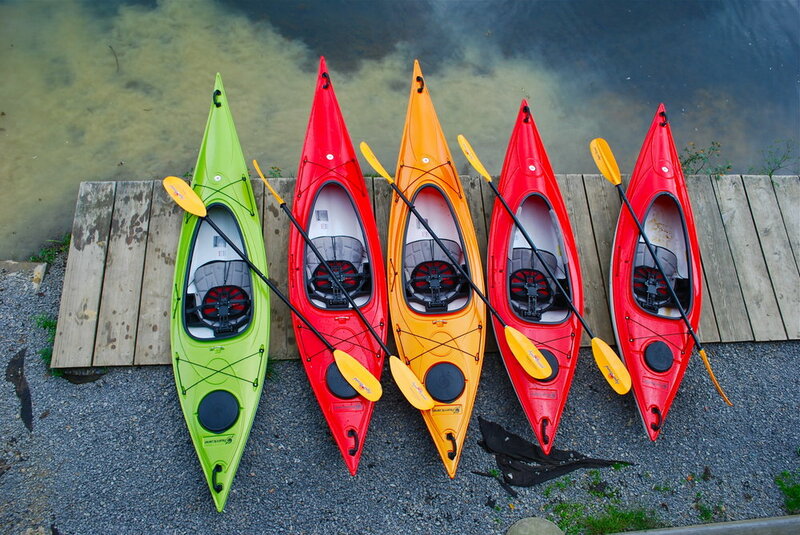 Eddyline also produce thermoformed polyethylene kayaks. Oriented a bit more toward transitional and day-touring boats, the Eddyline boats are graceful looking with excellent performance. Wenonah Canoe produce a vast range of canoes, all of which are available in Kevlar or Ultralite Kevlar. The Wenonah designs are legendary, and they have a canoe for every purpose, and in the ultralight layup, they can weigh as little as 39 lbs for a 16' canoe.